Across Ontario’s cottage country, craft breweries are producing award winning beer that embodies the rugged landscape and bold spirit that inspired it. But did you know that the region also boasts two distilleries and a winery? From authentic whisky and rum to a uniquely Muskoka gin, and wines crafted from the fruits of the land, no trip to the wilderness north of Toronto should be complete without a stop and sampling session at one of these unique operations. Copperhead Distillery and Spirits Limited moved into their new location at 68 Tower Road in the village of Sundridge in December 2017. While unassuming from the outside, inside the store you’ll find a Wild West atmosphere with products displayed along hand-built shelves supported by real wooden aging barrels. 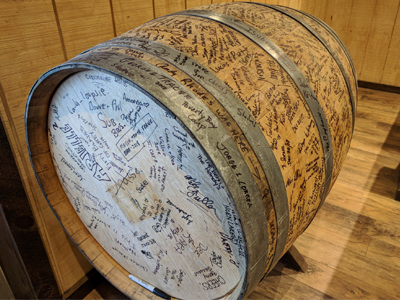 There is a solid wood tasting bar, held up by two more barrels, where you can sample their wide product range while listening to tales of the distillery’s creation and ties to the “shiners” of old. While their products are sold in corked bottles at LCBO locations, their Sundridge storefront embraces a more authentic moonshine tradition by offering their products in beautifully labelled Mason jars. There is also a refrigerator to keep their line of specialty spirits cool. 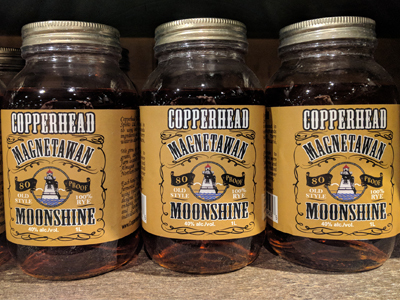 You can choose from Copperhead’s Irish Cream, Chocolate Almond Cream or their signature Apple Pie Moonshine which is also available warmed for enjoying at the bar. Copperhead offers more than 15 unique varieties of spirits. Their best selling Magnetawan Moonshine rye whiskey was one of their very first recipes and is one of five whisky products on offer. Created using pure rye, pure corn, rye and corn blends or barley, there is a whisky to please connoisseurs of all tastes. Copperhead’s line of Pirate Rums has also gained a loyal following. Named after the Almaguin Highland’s Ahmic Harbour, you can choose from Spiced, White, Molasses and Coconut varieties. If Vodka and Gin are more your style, they have you covered as well with their famous Black Currant Vodka, Sterling Creek Vodka or their Ol’ Biddy or London Dry Gins. Four of Copperhead’s products can now be found in over 50 LCBO stores: Magnetawan Moonshine Rye Whisky, Almaguin Ironcat Smokey Whisky, Pirate Coconut Rum and Black Currant Vodka. However, it is well worth the trip to Sundridge to visit the store and sample their diverse concoctions in person. Beginning this summer, the distillery will also be offering tours so you can experience how their spirits are made firsthand. Founded in 1996, Muskoka Brewery in Bracebridge was cottage country’s first brewery. For more than 20 years Muskoka Brewery has made a name for itself with recipes like its classic Cream Ale as well as for creating some of the province’s best small batch, experimental and seasonal brews. Out of their popular Legendary Oddity beer, brewed with orange peel, juniper berries and heather tips, came the idea for a new product – Muskoka Legendary Oddity Gin. The brewery purchased a still in 2015 and, with help from a fruitful initial collaboration with Stratford Ontario’s Junction 56 Distillery, they perfected a bespoke gin recipe with a unique Muskoka flair. It starts with fresh ingredients inspired by its namesake beer. Paying homage to their brewing heritage, Sorachi Ace hops were added to the juniper berries, orange peel and heather to create a gin with light floral notes and a subtle bitterness that balances out the traditional pine and juniper profile. 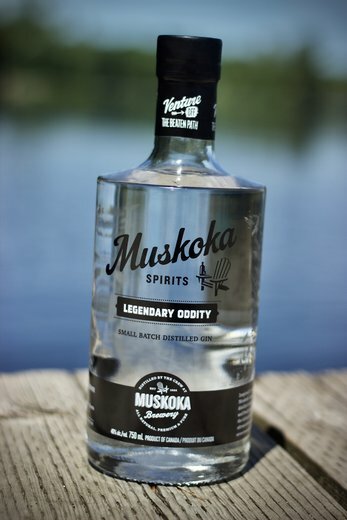 Muskoka Legendary Oddity Gin can be purchased in some LCBO store locations in Toronto and Muskoka, but the best place to purchase is the Muskoka Brewery Taphouse located on Muskoka Beach Road just outside of Bracebridge. While there, sample their extensive line of beers, relax by the fire in classic Muskoka chairs and purchase some swag for your home or cottage. Taking a bottle home and wondering what unique cocktails you can whip up? Check out some of Muskoka Breweries recipes here, like the Berry Refresher, Grapefruit Gin & Juice, and the Cucumber Sparkler. 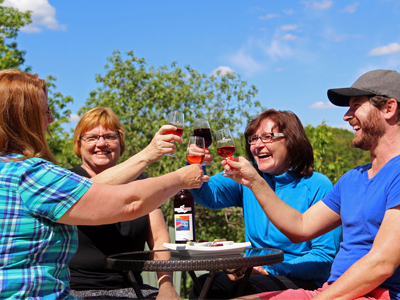 Another Cottage Country favourite, Muskoka Lakes Winery has been producing wine since the year 2000. An offshoot of the famous Johnston’s Cranberry Marsh in Bala, the winery began with two products that still represent the core of their business – Cranberry and Cranberry Blueberry Wines. While many other varieties have been created since then, Muskoka Lakes Winery has held true to its roots by maintaining traditional small-batch methods using the fruit they harvest from the wild Muskoka landscape. Their Bog to Bottle Discover Tour, offered three times a day all year round, has been designated a Canadian Signature Experience. This guided farm tour takes visitors on an authentic journey through the stages of the cranberry growing and harvesting season as well as the complex process of producing award winning wines. Then finish the tour with a tutored wine tasting led by one of the winery’s experts. Be sure to plan time to sit and enjoy the patio, with a view of the harvest complemented by wine and seasonal, local cheese plates. The laid-back lifestyle and rugged landscape of Ontario’s cottage country has produced an adventurous spirit among residents and visitors alike. Copperhead Distillery and Spirits Ltd., Muskoka Brewery and Muskoka Lakes Winery have infused their unique line up of spirits and wines with genuine hard work and local ingredients to create something authentic and refreshingly unassuming. Plan a weekend or a week-long adventure to the region this season and be sure to visit one or more of these establishments to experience the craft and taste the results for yourself.